HUNDREDS of people attended a gin and fizz festival during ladies’ day at Henley Rugby Club. Ten businesses offering food and drink set up stalls outside the clubhouse at Dry Leas on Saturday. They included Mr Hobbs Gin, Fairmile Vineyard and the Chalgrove Artisan Distillery. 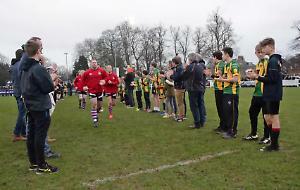 The event coincided with the Henley Hawks’ match against the Guernsey Raiders, which the hosts won 60-28. Many spectators attended the festival before and after the match as well as during half-time. There was live music and some guests dressed in yellow feather boas. The event was sponsored by G D Evans Interiors, of Emmer Green.